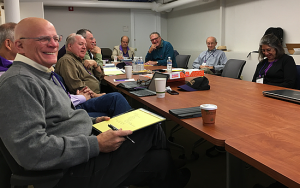 Tom Crowley, Ken McCurdy, Don Berens, Gates Hawn, Paul Miller, Fred Eames, Helen Moriyama, at Saturday Mini-Reunion meeting, Oct. 2017. You can also post “Help Wanted” “ads” here by using the “Reply” textarea below. And, if you have any ideas for special events, reunion requests or thoughts, or comments, please feel free to email our Reunion Chair, Halley Moriyama at [email protected]. Hope you’ll be generous with your time. These “big events” just don’t happen. Seeking classmates to assist in interviewing other classmates/housemates, researching and drafting web-ready articles and starting interactive Forum Topics of interest, and helping generally with the Reunion Web Site. A strong interest in the Reunion and working with classmates, plus a working knowledge of MS Word are all we ask. We’ll provide the basics about “writing for the web” and other web strategies used on the site(pictures! ), and help with final editing. You can work from home and make your own schedule. This is a 100% volunteer effort, as part of helping your class and the 50th Reunion effort. Contact Ray Kimball, Web Master, if interested at [email protected].